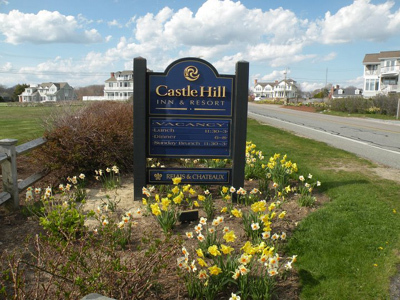 Castle Hill Inn & Resort - Fine dining and accommodations at their finest! 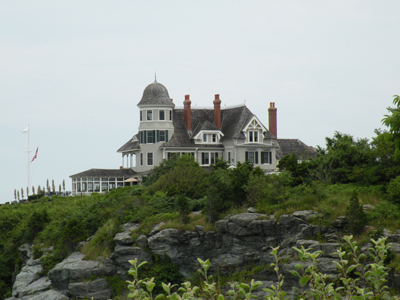 Newport Rhode Island Hotels are known for their charm and beauty. 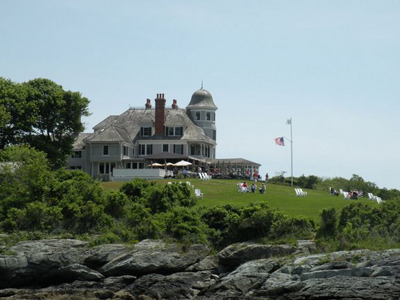 Whether you come here to dine, spend the night, hold a meeting or get married, you'll surely have a memorable experience at this Newport treasure. 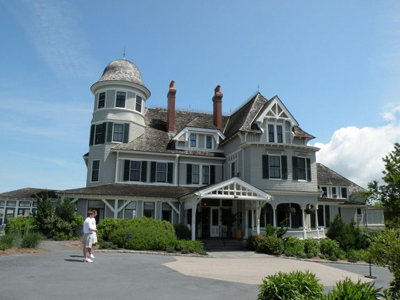 Formerly the summer home of Alexander Agassiz (Harvard marine biologist and the father of modern oceanography), the Castle Hill Inn & Resort is now a resort that functions as a hotel, restaurant, meeting facility and one of Newport's best wedding locations. I know firsthand how beautiful this location is. I worked here for a few years during high school, in the 1990's. 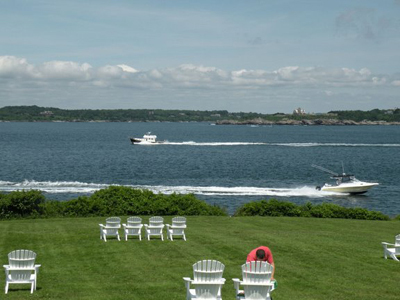 I worked here as a bellman, where I was able to see the look of joy on guests' faces as they entered their suite overlooking Narragansett Bay. As a bar-back, I enjoyed a front row seat to the live jazz music and beautiful sunsets on Sunday afternoons in the summer. 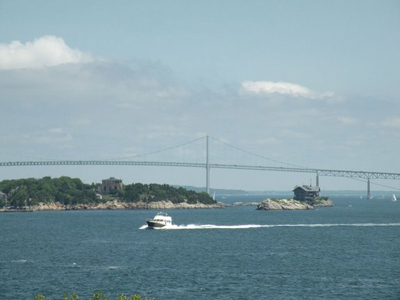 As a parking attendant, I passed the idle time waiting for cars to arrive on Sunday afternoons by watching the sailboats pass by the peninsula and enter into Narragansett Bay. This is one of the most spectacular locations in all of Newport, and shouldn't be missed. You've got a tough decision to make if you're going to stay here. Whatever you decide, I'm sure you'll be happy with your choice. 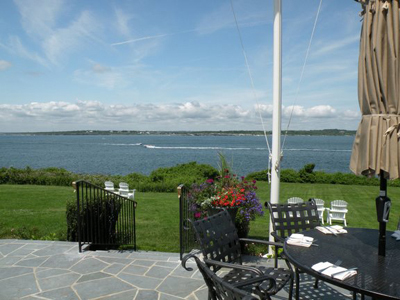 Of all the Newport Rhode Island Restaurants, I doubt any can compete with Castle Hill's view. 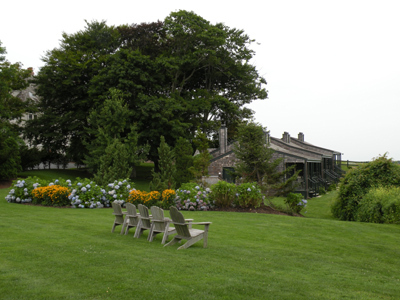 The mansion has four dining rooms, offering breathtaking views of Narragansett Bay and neighboring Jamestown, Rhode Island. Some of the amazing menu options include New England Lobster, Stuffed California Quail, Roasted Georges Bank Cod Loin and Grilled Hereford Beef Filet. Anyone else's mouth watering yet? The Inn boasts over 500 selections on their main wine list, and has been awarded the prestigious Wine Spectator Award of Excellence each of the past five years. Sunday thru Thursday 5:45 p.m. to 8:00 p.m.
Friday & Saturday 5:45 p.m. to 9 p.m.
Monday thru Friday 12:00 p.m. to 2:00p.m. Reservations are accepted for Lunch, Sunday Brunch and Dinner. Call 401-849-3800. No online reservations are accepted. The dress code is business casual. Men should wear a jacket. The Inn requests that cell phones not be used. The dining room can accommodate parties up to 40 people with advance notice and confirmation. 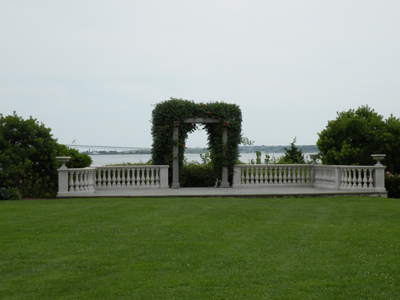 Castle Hill Inn is one of the best wedding locations in Newport. The views, seclusion and service will make your wedding day here a memorable one. The ceremony will be held on the Chalet lawn (yes, it overlooks the water), and the reception can be held in either the Chalet or on the terrace (party size and weather permitting). If you like, your entire wedding party and some of your family can all be accommodated here as well. 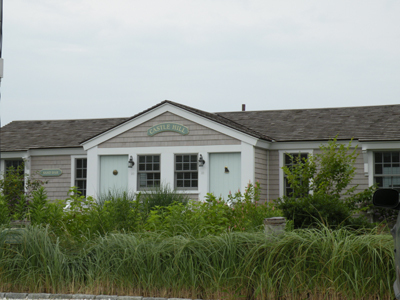 Between the Beach Cottages, Chalet, Harbor Houses and the main Inn itself, there is room for everyone. Just be sure to book your date well in advance. For more information, contact the Catering Department at 888-466-1355 or 401-619-3830. Where better to eat, sleep, conduct your business and get married than this picturesque and elegant waterfront location? 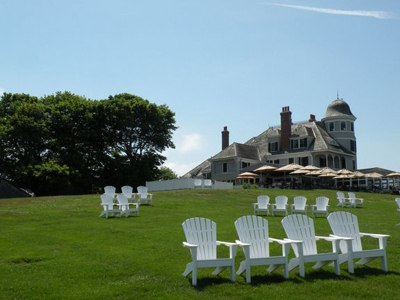 When weighing Newport RI hotels, this one should definitely be at the top of your list. If you're a guest of the Inn, you should definitely take a stroll down the Coastal Walking Trail. 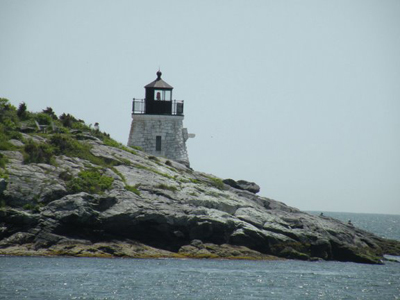 Here, you'll enjoy a closeup view of the Castle Hill Lighthouse and stunning views of Narragansett Bay.